These posters are easy to use. You just need to print them and hang them up so you can refer to them as you teach. It has all 4th grade math standards. It also has the complex standards broken into teachable parts. It fits great in rustic, farmhouse themed classrooms. 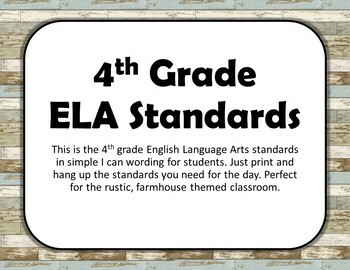 This is the 4th grade English Language Arts standards in simple I can wording for students. Just print and hang up the standards you need for the day. 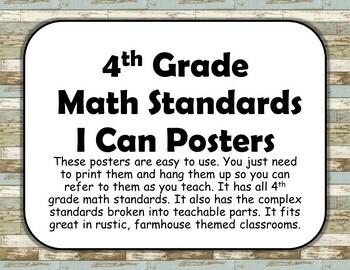 Perfect for the rustic, farmhouse themed classroom. 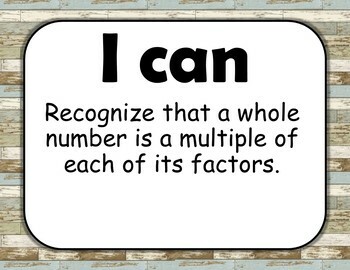 The bundle has the Common Core Standards for Math and Language Art. It is cute and easy to print. I use them to help the students know what they are expected to learn. 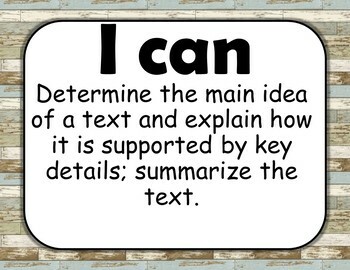 Each poster uses the words "I Can" to encourage students to try and gain the knowledge. The background is worn boards making it great decor for the farm or rustic classroom.